I've been reading several blogs lately, and a few of the bloggers have had issues with getting a handle on laundry. Since I've found a system that works great for my family, I thought I'd post about it. I wanted a sorter like this for YEARS, and finally got one about a year after we moved here. Here's mine. 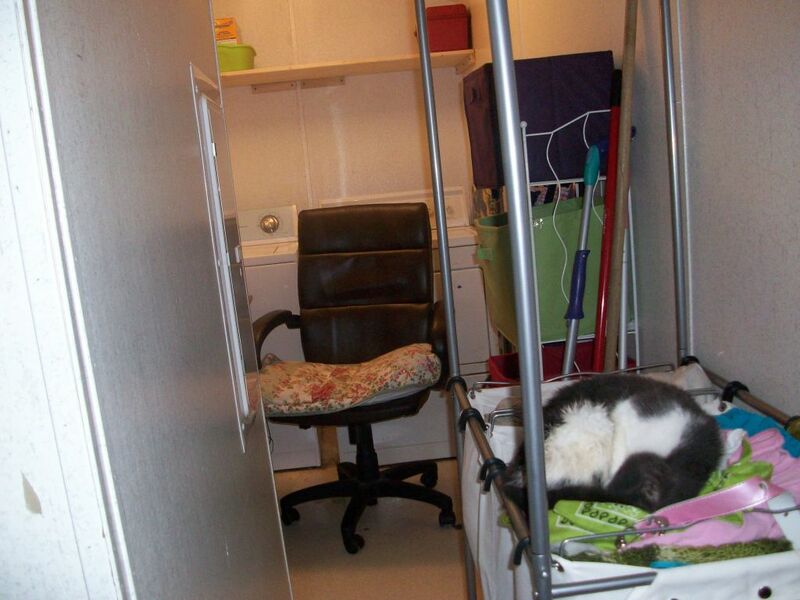 In the pic it looks like it's kind of far from the washer and dryer, but it's not really. This was taken a while back right after I'd filled the sorters from hampers. KC decided it was a good place to nap. Three to four times a week, I'll holler for everyone to bring me the hampers. There's one in the teens' room, one in the main bathroom that the girls use, one in Zoe's room, and two in the master bathroom (those two stay in the tub, one for regular laundry and one for wet stuff). The big canvas bags in the sorter are really big and can hold a lot, so when I get the hampers I take everything out of them and sort it all into the bags. Then I have them come get their hampers and take them back to their rooms empty. Very seldom will I still have to have a hamper sitting here with clothes in it. Usually just if there's a big blanket or comforter etc. Then since I work online in my office which is IN the laundry room Sun - Thur nights, I'll just start a load and I'm right there to remember to put softener in it and move it to the dryer and get another load going. What I'll do is take the clothes out of the dryer and put them in my desk chair (usually on one of my 3 breaks at work). Then I can hang stuff right onto the bar on the laundry sorter. I'll usually separate the hanging stuff by closet. So the teens' stuff all gets hung together since they share a closet. I'll hang mine and Hubby's clothes together as well. Zoe usually doesn't have anything to hang since all her clothes get folded and put in her drawers, but occasionally there's a jacket or dress. I don't worry too much about getting stuff out of the dryer immediately unless I know one of Christopher's dress shirts for work is in the load. Fortunately I have a dryer with a no-wrinkle setting that keeps tumbling and buzzing at me to remind me to come get the clothes. If I get his dress shirts out while the clothes are still warm and haven't sat for long then they don't get wrinkled. Of course they don't look as good as getting them pressed at a dry cleaners, but I'm not paying for that, and if I had to iron his clothes, he'd go to work naked. Seriously. It's not uncommon for me to pull the dress shirts out of the dryer, hang them, and leave the rest til later (especially if it's another hour til my next break.). I got this years ago for the bathroom to hold towels. 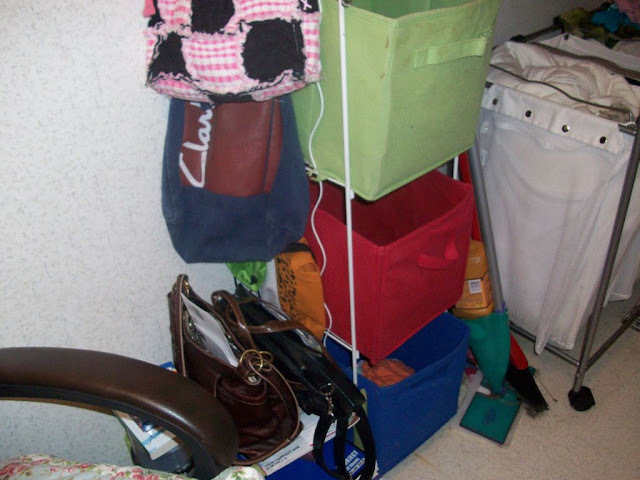 Then I realized the collapsible canvas cubby things fit perfectly on each shelf and there was room for four of them and I had four kids, so it was repurposed to the laundry room. Since the kids' stuff is color coded, I got a cubby in each color. Also, since Corina has moved out, I made her purple cubby into mine and Hubby's. 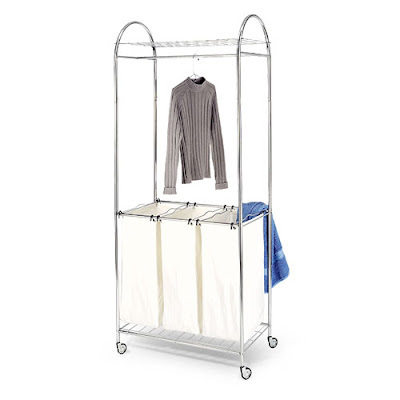 When she was still at home, I'd stack our stuff separately on the dryer then just take it on into the bedroom and put it away (our room is right next to the laundry room). So, now that it stays in the cubby, Hubby's underwear and sock drawer doesn't get filled as often and I am working on that habit heh. So, standing by my chair (basically where I took the above photo), I can quickly pick up something from the clothes in the chair, decide if it hang or gets folded, then either fold and put into the appropriate cubby or hang in the right spot. Having a place for everything makes it SO much easier. Since I do laundry while I'm at work in the middle of the night, I can't just holler for the girls to come get their clothes when I'm done. 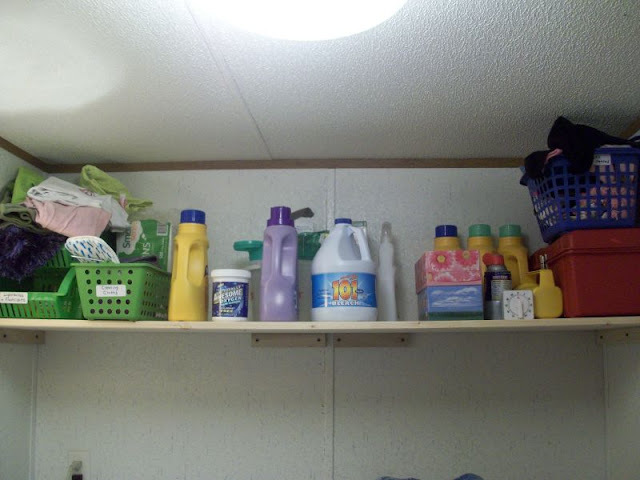 In fact, the older girls have been known to just come to the laundry room to grab socks from their cubby in the morning and leave the rest even if I ask them to take them all back to their room. So, every now and then I threaten to take away cell phones and they suddenly appear and put their clothes away. Zoe has to empty hers twice as often since hers holds her pants and shirts too, but she's been pretty good about doing it when I tell her to. I do have to go check now and then to make sure they have put them where they go instead of just dumping them on their beds. My 13 yr old is the worst for this, but she's getting better. 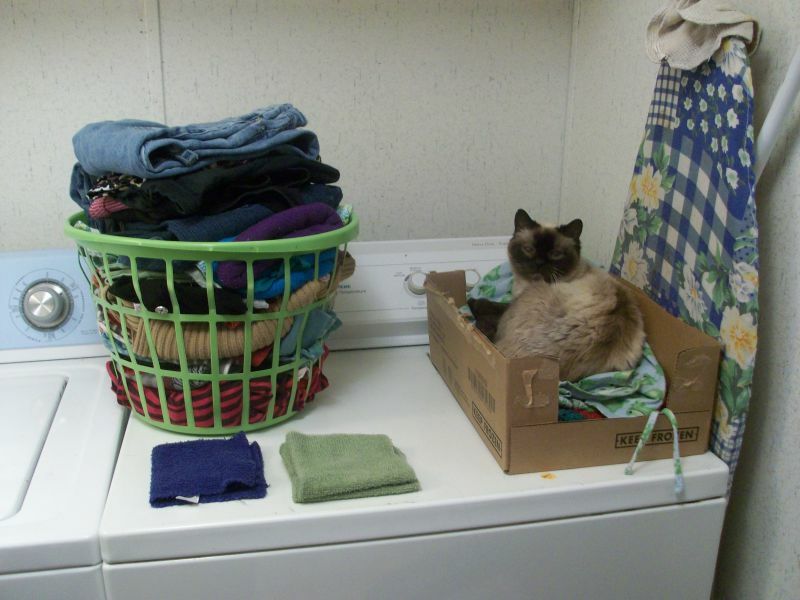 I had blogged about this for the 21 day challenge on laundry. Christopher built this shelf for me. Until then, all that stuff had to sit on the top of the dryer and usually washer too. It was a serious pain! Now I even have room for extras! You can see back there are extra bottles of detergent, and I have the big bag of napkins up there as well as extra boxes of tissues. Back behind the bleach is the stuff I need to make my own laundry detergent which I do from time to time, but the liquid stuff was buy one get one free, so I stocked up on it. Anyway that shelf has freed up room on my dryer. It's usually cleared off and I can use it to stack towels and sheets etc,... but today it's occupied with a basket of give-away stuff (I'm determined to get it all out of the house this week!)... and Meesha! It looks like Rhiannon changed in the laundry room this morning and her PJs landed on Meesha's bed. I don't think Meesha minds. Well, this may seem like basic stuff to some people, but I know some people struggle with it, and it literally took me nearly 2 decades to get a system that worked for my family. 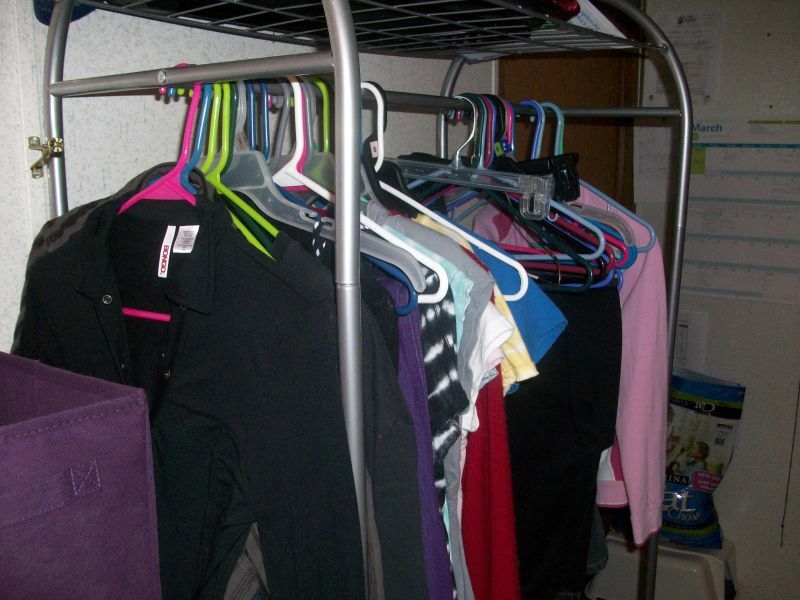 Most of the time my oldest kid was still home, laundry was always in a giant pile of dirty clothes as tall as she was in front of her bedroom door where the washer and dryer were. So so many things were ruined because they mildewed on the bottom of the pile. I remember even bagging up dirty laundry in trash bags and putting them in the storage shed just to make the pile smaller. Laundry paralyzed me. I just hope I can help someone in that situation. I know how it feels and I'll never forget that. Feeling a Bit Better, and Feeling Inspired! Laid up for a bit. Getting Back to My Routines and Some Advice. We redid the living room! Being Moody, Brainstorming and an IDEA! Frustrating Day Channeled Into Organizing! Going to be working on finances.